This business plan introduces Blue Cross® Medical Waste Recycling, LLC, a licensed waste management company that focuses on the recycling of medical waste. This business plan identifies all the things that could go wrong in the initial launching of Scottish Recycling Company. It also provides a roadmap to overcoming those problems along with strategies to succeed. This business plan shows a comprehensive process for recycling paper. 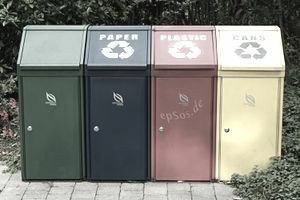 It explains ways to earn a profit from used paper and how recycling this material can fulfill growing demand. This company's business plan outlines how it's done. There is now a demand for recycled plastic products in consumer and industrial applications. The business plan of Replay Plastics describes one way to profit from that trend. It describes a process for establishing a polyethylene terephthalate (PET) cleaning and refining plant to produce recycled plastic products.